With a $4.5 million price tag, you will want to know what makes the Veneno so much expensive. The answer lies in the carbon fiber; the carbon fiber used for the monocoque, akin to the Aventador LP700-4 and also in the body panels. And everything inside is made from lightweight materials such as the forged composite materials made by Lamborghini themselves. All of this makes the car weigh only 3285 pounds at the starting line. The roadster has a 6.5-liter V-12 engine delivering 740 horsepower and consists of a seven speed, single clutch manual transmission. It has a full-time all-wheel-drive system and is balanced upon a pushrod-actuated suspension system. It can accelerate from zero to sixty mph in just 2.8 seconds and can reach a top speed of 220mph. Powered by the most powerful, road-legal, naturally aspirated engine ever made, the Aston Martin Valkyrie is a beast. Designed & manufactured by Cosworth, the same company that made the DFA V8 engines, that dominated the F1 scene for a generation, the Valkyrie’s engine is a masterpiece of technology. It is said to be a 6.5 liter V12 that can produce 1130 horsepower. If this is true it would easily dethrone the Ferrari 812, the current leader of the naturally aspirated engines. Aston Martin say that it will only be building 150 units of the Valkyrie and all of those have already been reserved even before the production is supposed to begin, in 2019. So it is safe to say that the Aston Martin Valkyrie is already a hit among the fans, despite the huge price tag. Coming from a company with a long line of fast supercars, the first thing that comes to most people’s minds, when seeing the Bugatti Chiron, is the top speed. Even though it is believed that it can reach up to 300mph the CEO of the French car company says that they have track performance as the main focus of the car. Details about the car is scarce but we know that is has an 8.0 liter, 16 cylinder engine with a quad turbocharger that pushes out 1500 horsepower. It has an all-wheel drive system and a 7-speed dual clutch transmission. The coupe’s design boasts of an aggressive yet, aerodynamic shape and the interior is nothing but luxury. This little bullet of a car is said to reach 60mph in just 2.5 seconds. Designed to commemorate the 70th anniversary of the legendary company, the Aperta is the limited edition spider version of the LaFerrari supercar. The main design feature of this car that stands out is that it does not have a roof. But it has been designed with a rigid structure with other elements compensating for this feature. Only 200 units of this hybrid hypercar is being manufactured and the orders are already piling in. The hybrid car has a 6.2-litre V12 non-turbo engine that supplies 789bhp and a mild-hybrid KERS system supplies additional power; brining the full output of power to 950bhp. It’s zero to sixty mph time is around 3 seconds and can reach 190 mph just 15 seconds in total. Even with the hybrid system this car guzzles gas at the rate of 12mpg in the city and 16mpg in the highway. With the initial sales price of 2.4 million left by the wayside, it is said that one can expect the final price to be around 3 million. This is due to the limited production of just 100 units and the reputation left behind by the likes of the Pagani Zonda some years back. The main reason for the high cost of manufacture for this model is the carbon fiber and titanium combination chassis supporting the structure. The supercar is powered by a twin turbocharged Mercedes-AMG 6 liter V12 engine that delivers 764 horsepower to the wheels. With a 7-speed automatic rear-wheel drive transmission, the car gives a mighty boost during acceleration. It reaches 60mpg in the just 2.9 seconds and has a top speed of 210 mph. The Koenigsegg Regera is the latest supercar unleashed by the Swedish firm and is touted to be a hybrid hypercar. Koenigsegg may be a small company but this beast capable of delivering close to 1500 horsepower at a torque of 1475 lb-ft. It can reach 0-60 mph within just 2.8 seconds and can reach speeds close to 250mph. At the center of the Regera 3 electric motors combine with the 5.0 liter twin-turbocharged V8 to deliver power to the drivetrain. The electric drive can provide up to 700hp and the engine itself can deliver up to 1100hp. It is said to reach its top speed of 250mph or 400kmph in under 20 seconds. With such specs you can be sure that all units of the Koenigsegg Regera will be sold out in a blink of an eye. Built by the Danish company Zenovo Automotive, the Zenvo TS1 is the second car to be manufactured at the small firm. With plans to build only 5 units per year and coming close to a whopping 2 million in price, one might wonder what is special about the TS1. Well it as nearly always, has to do with the numbers. It is said that with a total output of 1200bhp the car can reach up to a top speed of 233 mph. With numbers such as those you can reach the top pretty easily. The TS1 has a 5.8 liter V8 engine with twin superchargers, built by Zenvo themselves, that delivers a whopping 1163bhp. It has a 6 speed manual transmission with a paddlle shift gearbox. Together with a rear wheel drive system based on a Torsen limited-slip differential, the car can deliver amazing levels of acceleration. The car reaches 62mph in just 2.8secs which rightfully earns the car the title of supercar. Marketed as a luxury supercar, the Eventra certainly has the looks as well as the muscle to warrant that moniker. Manufactured by Mazzanti Automobili, it has a bold claim; that it is the most powerful street-legal car built in Italy. And by generating 36bhp more than the famed LaFerrari, it most certainly can. The Mazzanti Evantra achieves this using a turbocharged 7.2 liter V8. Mazzanti says that the car can reach 0-62mph within 2.7 seconds and that the car will have a top speed of 250mph. The interior of the car certainly looks luxurious and Mazzanti is providing tailor-made designing based on the requirements of the buyer. If you want to purchase one, you better hurry up and place an order because the company is only planning to make 5 units of this car an year. The Arash AF10 Hybrid is claiming to have something that no other car has; a warp drive. With the new hybrid version said to be generating 2080bhp, you just might believe it to be so. The car was first revealed at the 2016 Geneva motor show and the Warp Drive name, the 2080bhp and the claim of having 5 gearboxes certainly turned some heads. Since the car is still in production there aren’t any reviews out yet. But the manufacturers are calming a less than 3sec zero to sixty time and a top speed of over 200mph. The five gearbox story comes out of the car having 5 electric motors on top of its huge V8 engine. Each of those is said to have a separate gear box. It’s the combined 4 electric motors and engine drive system that they have coined the warp drive. As if whether the Warp Drive can deliver, well, we’ll have to see in the future. Named after the Brazilian Formula One legend Ayrton Senna, McLaren has built a surefire mechanical marvel that honors him. The Car is super lightweight and is running on tons of power and critics are claiming that it is the best that McLaren has ever made. With a 4.0 liter twin turbocharged V8 engine, it provides the Senna with 789hp of power at a 590 lb-ft of torque. This might seem a bit less compared to the other supercars of this list but with a host of carbon fiber elements and superior aerodynamics, the Senna can give any one of them a good run for their money. With just 2.7secs to reach 60mph and a top speed of 211mph, you will see that this certainly is possible. With only 500 units being made, there are still only prototypes available to be driven, but make no mistake, the McLaren Senna will be a name long remembered, just like its namesake. 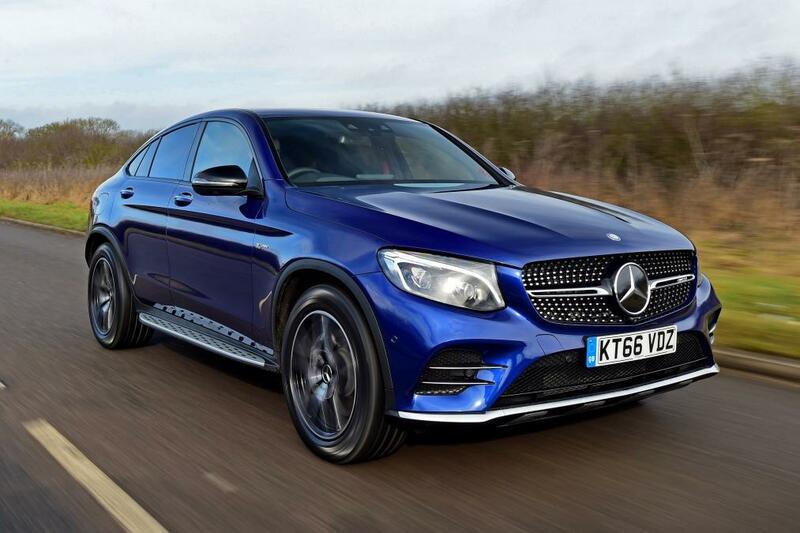 The new GLC 43 model is the fastest and most expensive version of the premium SUV. It’s designed to offer a more civilised middle ground between the scorching GLC 63 due later this year, and the mainstream diesel models. We’re trying it in the more style-oriented Coupe form to see if it achieves that balance.